If you lead a busy life with things going on all the time, it can be a challenge to keep track of the smaller stuff like buying more printer paper and changing the oil in your car. Your brain is throwing out constant reminders of every small or large task you need to take care of, and when the number of things you need to do gets too high, things are forgotten. Keeping a prioritized list of what you need to do can help make life go a bit smoother, but a scattered brain will use different kinds of pens, paper, and make it hard to differentiate what’s garbage or a list as we leave them all over the place. While taking notes is helpful, making sure you’re not switching from using Post-It notes to a piece of paper ripped off an envelope is important too. 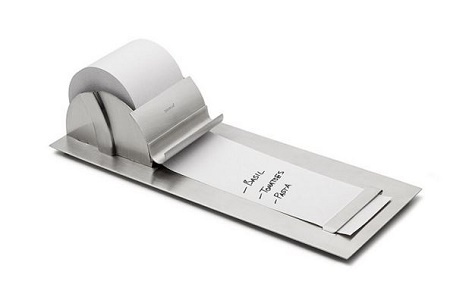 This Notepaper Roller is for expert list-makers who make a million lists and need to stop using paper that is designated for other tasks. Made of stainless steel, this can sit in a central location of the house, or be mounted onto the wall nearby the kitchen for grocery lists, or wherever you most often rearrange your thoughts. Having a more organized way to keep your thoughts aligned helps keep things in order. This is a $28 purchase, and you’ll need to buy more paper if you’re tearing through lists pretty quickly. Since we’re all about to start making resolutions to be better versions of ourselves this next year, it’s a good idea to start organizing your life little by little.